Brad Pitt’s Next Role: U.S. Judge? Proposition 8’s unconstitutional ruling made history last month, and the trial has been captured in Dustin Lance Black’s star-studded play. Are you free this Saturday night to watch a star-studded play based on a pivotal moment in history? Clear out your evening for the likes of George Clooney, Martin Sheen, Jamie Lee Curtis and more, who will be staging Dustin Lance Black’s play 8. The play captures an unprecedented account of the Federal District Court trial that overturned Proposition 8, ruled unconstitutional last month. And who will play U.S. District Chief Judge Vaughn R. Walker? 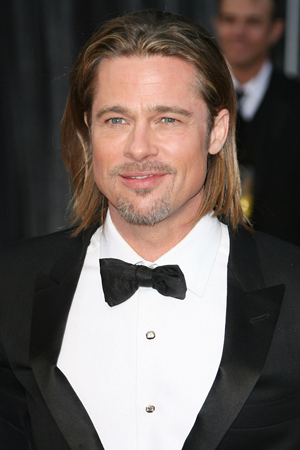 Moneyball actor Brad Pitt will read for the historical role. The performance will take place at the Wilshire Ebell Theatre on Saturday night in Los Angeles, and will serve as a fundraiser for gay marriage efforts across the country. George Clooney and Martin Sheen will play the plaintiffs’ lead co-counsel David Boies and Theodore B. Olson, and Christine Lahti and Jamie Lee Curtis will take on the roles of Kris Perry and Sandy Stier. Matthew Morrison and Matt Bomer will play Paul Katami and Jeff Zarrillo, the gay couples that filed the suit. Jane Lynch will play anti-gay marriage activist Maggie Gallagher, co-founder of the National Organization for Marriage, while Kevin Bacon will portray the lawyer defending Proposition 8, Charles J. Cooper. John C. Reilly will play marriage equality advocate David Blankenhorn, founder and president of the Institute for American Values. The reading will be directed by Rob Reiner. Whether you’re in Los Angeles or not, watch the premiere of 8 via American Equal Rights on YouTube. The pre-show begins at 7:30 p.m. PST, and the groundbreaking reading is scheduled for 7:45 p.m. PST.